The First Ever Designer & Developer Collaboration Tool. 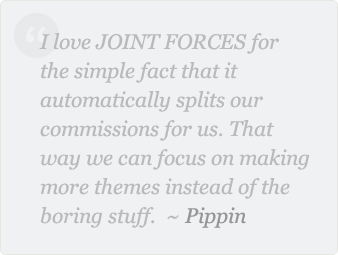 Upload Work as a Team & Have Commissions Auto-Split. All you Programming Ninjas and Design Rockstars have been clamoring for a way to collaborate and put out the hottest designs built on the best platforms. WE LISTENED and starting today JOINT FORCES allows you to COLLABORATE with your favorite designer or programmer to offer the best themes to the MOJO Nation. And the really cool thing is that MOJO takes care of all the logistics for a seamless allocation that is defined by you and your joint development partner. You and your partner control the process and MOJO makes it easy! Once you’ve got your theme team assembled make sure all of you are signed up with MOJO, pick a member to upoad the theme for the team and you’re all set! You’ll all have shiny new JOINT FORCES badge to show off and you’ll all be credited for the item too! Pretty cool huh? Create your own team and interact with fellow sellers. Oh snap! Along with creating this awesome functionality for all the MOJO community, we’ve also created a dedicated section within the forums. You can chime in anytime to recruit new teammates or find that perfect designer or developer for your theme dream team. The possibilities are endless and we can’t wait to see where this takes us.